Notice tiny solid skin bumps under your eyes? No, it's not acne or whiteheads. It's called syringoma. It sounds intimidating especially since it ends with '-oma' suggesting its tumor-like nature. So is it actually a tumor? Well I�d like to say no but it really is a kind of tumor. So how do you treat syringoma? Excision: the dermatologist will use a small scalpel to cut and take out the syringoma one by one. This might take a long time and may hurt especially if it is deep which is why anesthesia is sometimes needed. Electrodessication and curettage: the curettage part simply means that the syringoma will be scraped down; this is followed by electrodessication which will dry/burn the area using electric current. The 2 techniques will be repeated alternately until the doctor is satisfied that the syringoma plus a little of the normal skin area is clear. Dermabrasion: this is a milder form of scraping; doctors may use diamond-tipped pens to abrade the surface of the syringoma until it looks flat. CO2 laser: the laser kills tumor cells. Application of 50% trichloroacetic acid may be done after the laser; this was said to be effective for removing deep-seated syringoma cells and for reducing the side effects like scarring. 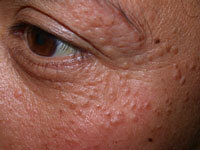 What's difficult with the treatment of syringoma is that they recur or scars form after treatment. In one study, the CO2 laser was used and results were successful; there were no recurrences within 2 years after therapy and there was no scarring. However, physicians report that the side effect included prolonged reddening of the treatment site and repeat sessions were sometimes needed. CO2 laser treatment is quite costly but its safe, long effect and non-scarring qualities make it a good choice over other treatments. In another study, electrodessication -in short bursts and low voltage - was used to treat a patient. It turned out to be as effective as the CO2 laser in terms of having no recurrence in 2 years but this study was only done on 1 patient. Plus this method is invasive and requires a needle insertion into the reticular dermis. It is also safe, non-scarring but in comparison with CO2 laser, this one's quite painful and not recommended for people with low tolerance to pain. Creams are also available for syringoma but some products lump the treatment together with warts and moles so that their creams would say 'wart-mole-syringoma' remover. I have not personally used these creams but from videos available over the net, these creams are powerful and sometimes dangerous. 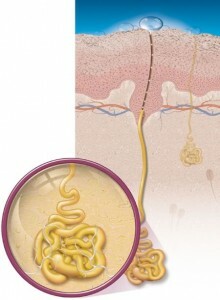 They can get deep into the skin and within a few weeks, your wart, mole or syringoma will just drop or peel off. That's after enduring a few days of hiding from people because your wart/mole/syringoma will get darker. The creams are effective but they also leave deep craters that I honestly don't know if they will heal on their own. It's like you lost a mole/wart/syringoma and let the whole world know about it by leaving a gaping hole. Ok, not gaping, but it really is quite deep. Well, it's still best if the real users would testify to the syringoma creams and actually there are some good customer reviews online for some creams. Whatever the brands or clinics you use or go to, what's important is that careful usage is needed to avoid the unwanted adverse effects of any of these treatments. With time, I'm sure you'll find the right solution to your syringoma. Syringomas are benign tumors of eccrine origin commonly found around (usually below) the eyes.